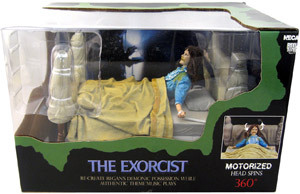 Description Of Item: The classic scene of demonic possession from The Exorcist is recreated in this amazing boxed set. Regan is restrained to the bed in her demonic state, and with the press of a button you activate motorized 360-degree spinning head rotation timed to the famous movie scene along with demonic noises and sounds from the film. This is a must-have for movie and horror collectors and is sure to creep out your friends and family. Window box packaging.